This remarkable picture shows just how much junk surrounds the Earth. 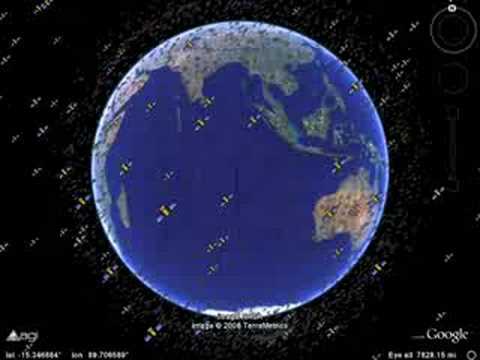 Since Sputnik was launched 50 years ago, more than 6000 satellites have been put into orbit. 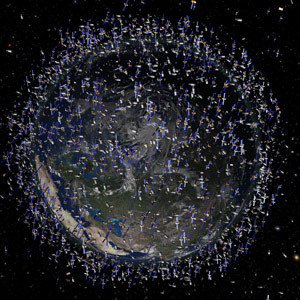 Only 800 are still working and the rest, along with rubbish left over from missions, are turning our planet’s orbit into a junkyard. The European Space Agency mocked-up this picture to emphasise just how much rubbish is out there. And they warn it could crash down on us or damage space craft unless action is taken. The number of objects orbiting the Earth is increasing by 200 a year and 80 per cent of catalogued objects are in low orbit – just 1200 miles above the Earth. Other debris includes tools dropped during space walks and rocket parts discarded after launch. There are also an estimated 50,000 undocumented pieces of debris of less than a centimetre.